Driving On The Right Side… Of The Road Or Car? 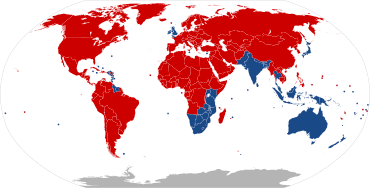 Those in blue are RHD and those in red are LHD. The terms left or right hand drive refer to where the driver sits in the motor vehicle not where the car is on the road. So in the case of Japan, the steering wheel is on the right hand side. Most markets that are already RHD will find much value in Japanese used vehicles. Areas such as South-East Asia, Oceania, Eastern Africa, and the British Isles are major importers. Because they use the same system as Japan, there are less hassles getting the vehicles imported. But just because a country doesn’t drive the same way as Japan doesn’t mean RHD vehicles can’t be imported. For example, Russia is officially regulated for LHD traffic, but Japanese RHD cars are the single largest supplier of used cars to Russia. Last year over 440 thousand vehicles where exported from Japan into Russia. Russia is estimated to have more than 1.5 million RHD vehicles on its roads. In the far eastern regions, such as Vladivostok or Khabarovsk, RHD vehicles make up to 90% of the total. Many other LHD nations are also importing RHD in the thousands without any problems such as Canada, UAE, Chile, Mongolia, Cyprus, and Peru. There are two considerations for importers. First, are RHD vehicles legally able to be imported, and more importantly, driven in your country. Even in the case that RHD autos cannot be used on your roads, many governments allow the vehicle to be modified so that it is switched to LHD. The second consideration is if you are willing to drive “on the wrong side” or will you be able to sell cars to customers that are RHD. It is not a matter of being a safety hazard if the driver sits on the other side. A Canadian study showed that RHD drivers were more careful, thus less likely to get into accidents, than those who drove like normal. It is also not about not getting able to feel comfortable driving RHD drive in a LHD nation. Most drivers who experience this challenge are able to overcome the awkwardness of driving differently within the first few hours on the road. The main issues are do you mind standing out a little bit and will it bring to much inconvenience to your lifestyle? For example, you’ll need a passenger to help you through drive-thru’s and at toll booths. If you don’t mind, and you can import, there are plenty of benefits. Image and Statistics from Wikipedia under the terms of the GNU Free Documentation License. Russia has seen a recent rise in the number of disassembled cars imported. The used cars are disassembled in Japan and imported as parts, rather than whole vehicles, to benefit from lower tariff rates. This is because Russian Customs office considerable raise the duties for whole car verses car parts. Once it is imported to Russia, a car is reassembled for on road use as a used motor vehicle. Because this has increased dramatically in the recent year (a knock-on effect of the revived/reviving economy), it is said Russia will be taking steps to discourage this “loop-hole” in the rules. Peruvian importers have had a new regulation for importing used vehicles since the 15th of November, 2007 that put restriction on importing vehicles by allowing used vehicles less than or equal to 80,000km only. Not too bad for them. Many Japanese used cars sold at auctions can run below that limit and still be cheap. It appears the New Zealand government will indeed put the stricter emission controls scheme into effect starting from the 3rd of January, which is expected to reduce the number of new and old vehicles compared to the previous years. At the requests of importers, they’ve made the ramp-up to higher emission regulations longer than previously set. This may (most likely some say) have an affect on number of imports coming in. Time will tell how long before importers start buying smart.